I've spent a lot of time working on models from 2001 - A Space Odyssey. Although they aren't quite done or need to be reworked, I wanted to start animating them to see how well they all play together with each other. 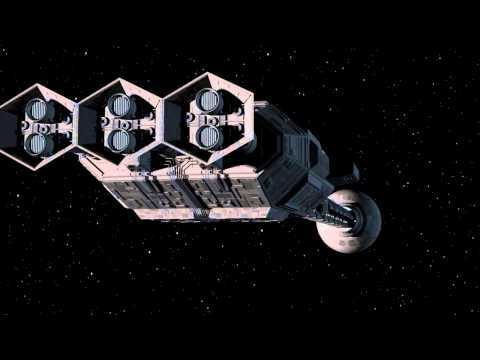 This first video clip is of the Discovery on it's journey to Jupiter. I tried to get the same type of shots as in the movie. The next video clip will include the pod bay, EVA Pod as well as the cockpit. As I am a total novice at lighting, any C&C you can provide would be greatly appreciated. Amazing piece of work. Yould could have easly mistaken it for the original film. Just curious about one thing, have you added a bit of noise post processing? No I haven't. Why did you ask? Ah maybe it is me seeing thinks I thought there was a very verys light hint of noise added to the video. No worries, it is just me. The video is very very good. No problem kippa. I did add some noise to the hull texture of the Discovery so it wouldn't be an unrealistic smooth finish. I had thought of adding a film grain to the render, but didn't in the end. I am trying a different video format for uploading to YouTube, so it could be the conversion. Always glad to hear questions or crits. It's the only way I am going to learn. Great work! My one crit would be to boost the lighting up a bit, maybe make it a bit warmer and make sure it comes over the edge in teh side shot to get the outline of Discovery like in the film. Beautiful model! Thanks japetus. Yeah, lighting is really difficult for me. It's funny that you mention lightening things up. I already did after seeing how it came out on Youtube. Lighting is an art form and something that I really need to work on. And then there is always the old saying "Looks good on my monitor!". I should really invest in a monitor calibrator instead of just 'eyeballing it' with a grey chart. I'll see what I can do in the next part. Most excellent piece of work... There was minimal evidence of it being anything other than a proper film. The one thing that looked odd was the pilot turning his head. It appeared to turn too quickly, but when compared to the whole, it was so minor it was barely mentionable.